This is not a comprehensive list, but this is a good start for what your list should look like for a short term event. Make sure you have a good estimate of the number of people you are preparing for to cover all their needs. Notice I said needs. Needs are often confused with wants. We want a lot of things to have a more comfortable experience while weathering the events we are preparing for. However, the necessities have to be covered first and that can be confusing sometimes. What areas do your necessities need to cover? At a minimum, those items have to be covered whether this is a short term or long term event. If you don't have a plan and the supplies to cover those seven areas, you will be less likely to survive or will be depending upon help. How long of a time for the events we are preparing for will determine how much we need to stockpile. As any prepper can tell you, we all make some mistakes in our stockpiles. Needs can change. What we thought were needs can suddenly become wants in a hurry. What we thought were wants could become needs in the right situation. However, the line is usually pretty black and white. You might say that you don't see prescription medicines or extra glasses on the needs list for short term events. If you have these things, you know that they are a need and you need to stock up on them. 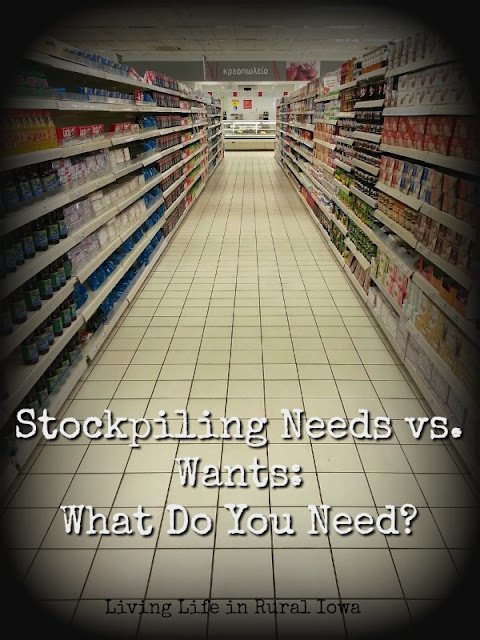 If you have things you honestly can not live without, you know you need to stockpile them. That is just common sense. As I have been making a concentrated effort this winter to use some stockpiles up, I started to ask myself if I really needed to stockpile these items. Sure I use them and certainly have a need for hand lotion and foot lotion during the winter. But...did I need 10 tubes of each lotion? I go through approximately 1-1.5 tubes a winter. I can make this stuff last awhile! And...do I really need it? In the short term event, I could live without. In a long term event, I would okay until my stockpile ran out. Then I would have to live without or figure out a substitute from my food stockpiles. You will hear so many people say they cannot live without X, Y or Z. There are some really vain people out there who have fooled themselves into thinking they need superficial things. No, most women do not need makeup or jewelry, but you would be amazed by how many think they do. You would also be surprised by how many men cannot live without air conditioning or television. In a crisis, these people are usually the ones to complain the loudest because they don't have their "needs" met. A word of warning: if you are preparing for an event and live with someone with an addiction, you need to prepare and stockpile for that too. This is not a pleasant thing for most people to do. However, if you have a smoker or a drinker in your home, you need to anticipate that. The withdrawals can be harsh and really not something you want to deal with in a crisis. The same goes for someone who depends on caffeine or eats a fair amount of sugar. The headaches, mood swings, fatigue, and other symptoms of withdrawal are not easy to deal with in a normal situation much less a crisis. Food and water are necessities. Soap is a necessity. First aid items are necessities. Many other things are not. While only you can determine what is a need versus want, you really need to decide what you can and cannot live without.